I am a young pastor, and I do not presume to think that I can offer up much worthwhile advice and encouragement to a new generation entering the ministry. I do think, however, that any amount of experience has its own level of anecdotal instruction that can be offered to anyone willing to listen. This week, I have thought about what I have learned in my decade of formal ministry (volunteer and paid) and I think there are some things that are worth sharing. Some items being shared in this blog are a result of frustration that has helped to grow me as a minister. Other points are simply things I that have come to mind. Just know that none of them are meant to demean, discourage, or demonstrate anger. I just feel these things need to be said. I love learning. Sometimes the learning involved pain, and other times it was a result of great joy. 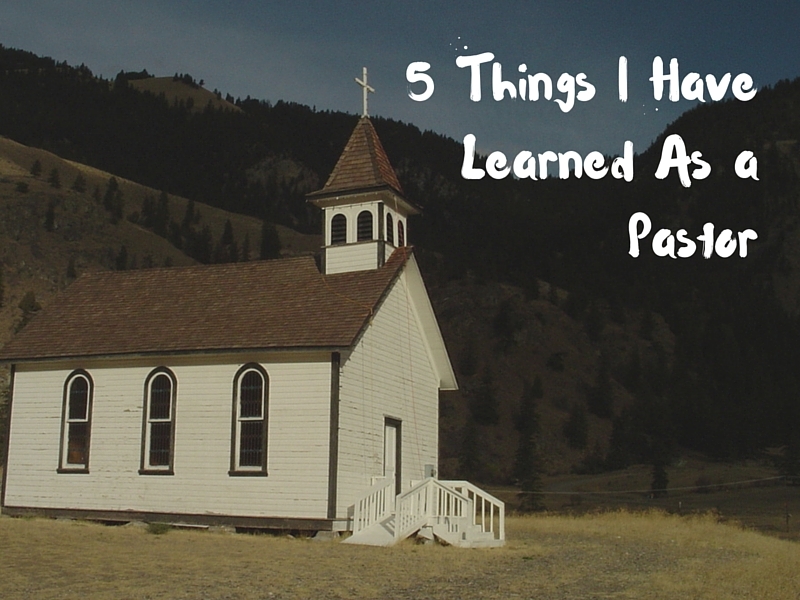 Today, I want to share 5 Things I Have Learned As a Pastor. Sunday after Sunday pastors all over the world work their hardest to preach, teach, and display the Gospel in their lives. Their families often feel the brunt of the time and effort they put into sharing vision, meeting with those in need, and attending business meetings. Sometimes a pastor will give their all for a congregation who seem to look at the idea of worship as “something they will attend if they have nothing else to do”. Don’t get me wrong. Pastors are thankful that anyone shows up for worship, but we now live in a Christian culture that has prioritized other things over meeting together as was commanded of us in scripture. I’m going to let you in, behind the scenes, for a moment on what pastors talk about when they are together. Sometimes we talk about how things are progressing with the church. Other times we talk about how discouraged we are in a particular area of ministry. For some people in ministry, short seasons of discouragment end in resignation. It is easier to quit than to persevere. When discouragement comes, and it certainly will, it is always vital to lean into God and rely on His promises. The seasons of discouragement do not last forever. They can just be painful. When we tap into God’s resolve, then we find times of great spiritual wealth and ministerial progress. No matter what God has asked a person in ministry to do, resistance to that call is inevitable. Sometimes there is resistance because the author of lies is creating unnecessary conflict in the church. Other times (I am speaking to myself here) it is because personal pastoral agendas are forced and God’s will is not taken into account. Pastors are not exempt from being stubborn or having human thoughts, emotions, or actions. A consistent prayer life trains the mind and heart to more readily pick up Christ’s signals and gentle nudgings. When looking at scripture, it is apparent that God has spent a lot of time showing humanity His love. Sure, there are times of discipline, but the way He guided the Israelites out of captivity, restored them multiple times after their transgressions. sent Himself to die, and gave us the Holy Spirit, no one can deny the energy that has gone into God’s affection for us. He calls pastors to be distributors of this love and grace. Christians in general have this call on their lives as well, and are compelled to share this message with the world. So, when someone comments that a pastor’s focus is “all about numbers”, they are actually somewhat correct. Every person matters to God, and He came to die for every single one. A pastor’s job is a response to this concept. Ok, so this one is a difficult topic to talk about. Now, I do not want to sound harsh or condescending, but this idea breaks my heart so I felt as if I needed to share. You may read this heading and be somewhat confused, but allow me to explain. I wrote another blog post a while ago that compared the personalities found in the church to animals that live in a zoo. Lemurs are animals that live in trees and eat berries and bugs. When there are no more berries or bugs in the tree they move on to another one that will suit their needs. Butterflies start as caterpillars, and camp out in trees or bushes. They are sheltered by the tree and allow themselves to be transformed. Often churches respond to God’s call to help those in need (in and out of the church), and sometimes it is the “lemurs” get the most attention. In the church, it is often the case that the ones that are the most helped are the first ones to leave. The church is a great place to seek transformation. No matter the result, though, we are called to serve. Overall, I can honestly say that God has blessed me more than I deserve. His calling on my life to participate in the transformation of souls is something that invigorates me. Ideas keep me going, and His spirit not only makes up for my inadequacies, but moves me out of the way completely. He has also given me an amazing church family. If you are a young pastor leading a church today, I implore you to lean on that calling. Don’t quit. It is a very difficult job, and it is not going to get any easier. You are not going to make millions and you may struggle to help grow the congregation you are in. Don’t be a “corporate ladder” type of pastor and just move to the next bigger church for the nice facility and salary package. There is a large family sitting in your pews waiting to see revival, and their souls need it. Be vulnerable, and build deep relationships. What if they leave? Well, then you will be deeply hurt, but don’t run away from being hurt. God’s call means more.